The Online Clinic is prepared to prescribe Ventolin inhalers to treat asthma if you have already been prescribed this medication by a doctor in an online environment and you agree to have an annual check-up. 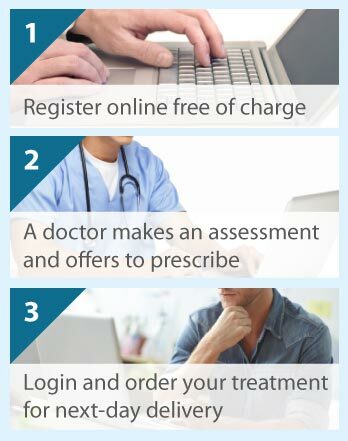 Prescriptions are issued online and the treatment is delivered the next day from our pharmacy. Ventolin inhalers contain a medicine called salbutamol that helps to keep the air passages in the lungs wide open so that you can breathe more easily. This is especially helpful during an asthma attack when airway constriction can cause breathlessness. The inhaler can be used to provide rapid relief as soon as you experience breathing difficulties, chest tightness or wheezing. It can also be used to prevent the onset of asthma during exercise. The Ventolin inhaler holds salbutamol in the form of a powder. The inhaler uses a propellant to deliver the medicine directly to the lungs. That is why it is so fast acting. Some of the newer inhalers use environmentally friendly propellants. Ventolin comes as an Accuhaler and Evohaler. These contain 200 mcg and 100 mcg of Salbutamol respectively. The instructions included with the packaging will show you how to use and maintain the inhaler device. You should not change your dosing without discussing the matter with your doctor. We only recommend use of Ventolin if this is your normal inhaler prescribed by your GP or other doctor. We will advise you not to use Ventolin if you are pregnant or breastfeeding as its safety under these circumstances has not been established so a face to face consultation is necessary to establish the risk/benefit balance. Ventolin should not be used if you have a known allergy to salbutamol or the propellant. If you have unstable or severe asthma your doctor will probably prescribe Ventolin in combination with other medicines to make sure your condition is properly controlled. Fewer than one in 10 people get any side effects with Ventolin. Some people describe 'feeling shaky' or develop a headache after using the inhaler. Others sense that their heart is beating faster or more strongly than usual. If you experience changes in your heart beat while taking Ventolin you should see your doctor as soon as possible. In most cases these symptoms go away with continued use. Less common side effects include mouth and throat irritation and muscle cramps. You should also arrange an appointment with your doctor if the inhaler no longer provides relief. Under no circumstances increase the dose above the recommended maximum daily dosage, which is 4 puffs of an Accuhaler and 8 puffs with an Evohaler.